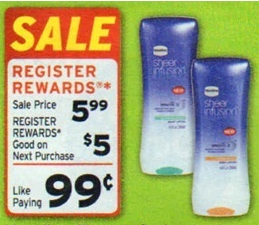 Right now Walgreens has their Vaseline Sheer Infusion Lotion for $5.99 and you can earn $5 in Register Rewards at checkout. Be sure to review my Walgreens 101 Tutorial to see how Register Rewards work. Note About Printing Coupon: To get the coupon you will need to be logged in to the site. Once there click “Special Offers”. Then click “Get Coupons” on the bottom right. Thanks, Living Rich with Coupons! I tried to print this coupon, all I see on this page is a coupon for the clinical Vaseline, not the Sheer Infusion. Is there something I am doing wrong? Copyright © Faithful Provisions / Hancock Group LLC, 2008-2019. All Rights Reserved.